And while it is still important to have a watchful eye on the needle, this 'Stitch-in-the-Ditch' foot helps alleviate guessing and serves as a smooth guide with which to stitch. (Note: You should always practice first on a small sandwich.) The guide on this foot is perfect because it allows you to stitch just a hair's width from the seam, keeping your stitching line straight. 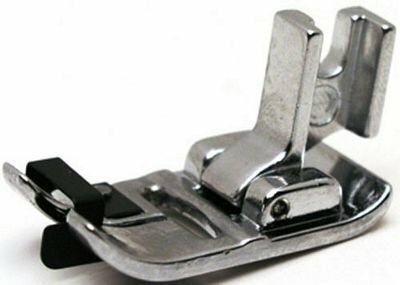 It is the ideal foot to have for seamstresses (as well as you men who sew, too) as another tool for Understitching - where you press seam allowances to one side and top stitch as close to the seam as possible. This holds the seam allowance down and causes the piece of fabric to stay folded under, especially useful for facings.